It is a real treat having a hot weekend to winterize the garden. Unheard of at the end of September here on the coast. 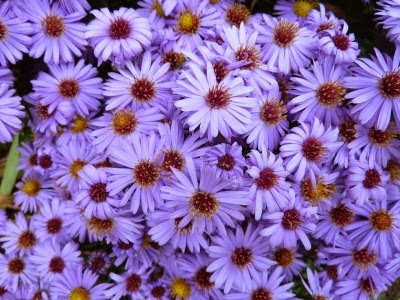 I am crazy about asters. The bees just love them and they are super easy to propagate. It goes like this. Grab a stem or two down low. Pull. You will end up with lots of roots. Pot them up or plant them right in the ground. Done!! Emptied out the bean pot..washed and put away. Next spring I am going to put my black bamboo in the pot and beans will go in the garden. I emptied out the pot that contained the potatoes my brother gave me. They are teeny, but there are 13. I will plant and try to get some seed stock for the following year. Brought daughter-in-law Amanda's outdoor plants into the yard to keep them until they can go into the new BTE (back to eden) garden in their back yard. They are tucked back by my own potted plants. Spoiler alert....The BTE garden should be beginning next week. The verges of our motorways are currently awash with Michealmas Daisies (a variety of Aster), looking beautiful in the Autumn sunshine. Over here we had the driest September since records began. Don't you just love this time of year Mark. It is amazing. 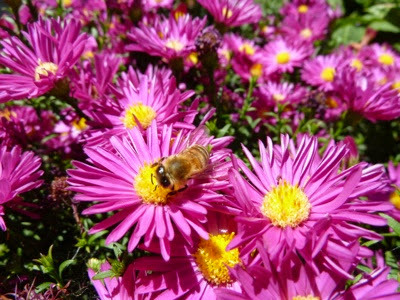 I am really watching this year so that I can plant flowering autumn plants for the honeybees next year. The mother of all Kombucha mothers!